Indian Railways.. And their trains.. They have a character of their own, don’t they? The best part about a train journey is that you get to see so many different faces and talk to so many different people. But it’s fun only when you have a short daytime travel. And it certainly doesn’t suit well if you have been awake the whole night and now have to get some sleep. Sleep. That’s a luxury even in luxury trains. When I was booking the ticket on this train, I knew a typical “Sleeper Class” coach will never allow me to get that much required sleep through the day. The train would reach Jammu Tawi only in the afternoon. And if I spend the whole time trying to get some sleep in a Sleeper Class coach, then the rest of the day would surely be not enjoyable. So I had spent those extra bucks to get a comfortable “Two Tier A/C” coach. Did that help? No. I did get some sleep. It was mostly intermittent. Just like “24×7 power supply” in Bangalore. The number of people strolling in the narrow passage of the coach was probably more than those who were actually sitting in their berths. Add “chai chai chai“, “coool dreeenks” and “samose le lo” to that. Sleep? It’s indeed a luxury when travelling. When I opened my forcefully shut eyes to a gloomy and hazy afternoon, the train was crossing a huge river and a board next to it read “River Tawi“. 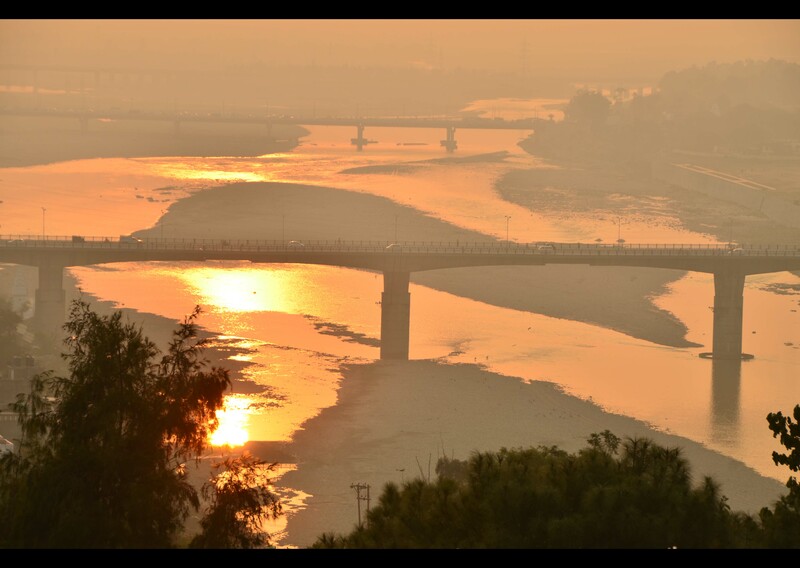 I had a “Oh that’s why..” moment when I learnt that “Tawi” is actually a river on whose banks Jammu is situated. The train pulled up at Jammu Tawi around 3 PM. Wow! It was the same station that was listed at the top on Rashtriya Atlas‘ train routes. I had never thought I would travel this far from home. It was comfortably cold outside the station and reminded me of a cool air-conditioned morning in Bangalore. I waded through the many “Riksha sir.. Riksha..“, “Sir hotel rooms.. Cheap hotel sir.. With AC..” calls and reached the main road. It looked deserted. I had never seen any locality surrounding the railway station of a major city so deserted in my life! I suddenly felt I was in Hassan! The best part about Jammu is that it’s close to Vaishno Devi. Proximity to the pilgrim centres is always a good thing. There will be “dharmachatras” everywhere. There was one outside the station. I did think about going into one and asking for a shared room. But.. I took an autorickshaw and asked him to take me to a locality with hotels. He agreed. I hopped into the auto – the first auto I had seen with a fabricated door on both sides. “Must be the cold” I thought. As the driver drove me towards “I don’t know where I’m headed to“, I could see men in military uniforms in every nook and corner. There were security check-posts and military bunkers everywhere. The fact that you’re in the most volatile state in India can send a chill through your spine. “Jammu aisa hai to Srinagar kaisa hoga?” I asked myself. I got dropped off in front of a hotel. I went around the whole place looking for rooms and nothing was below 1000 bucks! I couldn’t risk overshooting my budget. After walking around and knocking on multiple doors, I ended up at a small lodging facility who had “One room left sir, 600 rupee..” with them. I took it. I was asked to enter my personal details. The receptionist was staring at me as if I was a foreigner. I realized later that I was. As I was waiting for the keys, an elderly man – in his fifties and wearing a Pheran – walked in with a sizable family. The family went upstairs and as the man walked towards the reception, the receptionist touched my hand and whispered “Don’t talk anything. Stay silent even if he talks to you or smiles at you.” I couldn’t understand what was happening and so chose to stay silent. The man walked to the reception, gave me multiple cold stares, blabbered something to the receptionist in the local language, laughed loudly and left. I was later told that the man is a Kashmiri and is very influential in the region. I also learnt that there’s a general dislike among them for tourists from “India”. I realized that this place is a different country (not nation) in itself. What works elsewhere in India, may not necessarily work here. Prepaid-SIMs from Rest of India and Pep-Talks were surely among them. I freshened up, befriended the bellboy, learnt about the places to see and headed out. 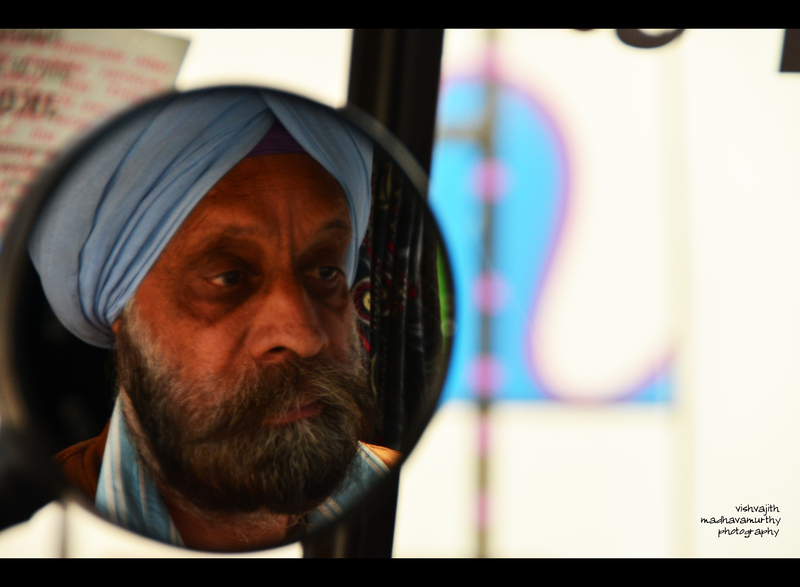 I hired an auto, this time driven by an old Sikh. He drove me to “Bahu Fort“ which is atop a small hillock. I responded to his banter with “Hmmm”s, and clicked his pictures. If it were Bangalore, I would just pull out my camera and shoot! Being in a place where “shoot” means something else, I was quite afraid and had to get the permission of my subject before I could click him. The fort is infested with monkeys and it’s really hard to walk around without being intimidated by them. Carrying a camera only adds to one’s troubles. It’s interesting to note that although the fort, standing next to a dargah, was under Mughal control, a temple dedicated to goddess Kali exists within the fortified walls. A typical Mughal-style garden known as “Bagh-E-Bahu” adds to the beauty of the fort. The garden also hosts a small aquarium, fountains and a small pond. Standing in the garden, I watched the sun go down into the Tawi. The city wore a hazy look and I would have loved to stay there longer if only the place offered some tranquility. But like most places in India, the place attracts too many locals who come there for picnicking. Tranquility, like sleep, is also a luxury these days. I took a local bus to get back to the market, and skipped the famous “Raghunath temple” which according to the bellboy was the “must see if you’re a Hindu” place. Although I don’t believe in pilgrimage, I do like to visit temples of historical/mythological/architectural importance. This had all the required parameters in it. But I skipped it after looking at the long queue. The temperature also had dropped quite a bit and for the first time in my life I wished I had a sweater to wear. Or a Pheran, maybe. I had to do with a pack of Kings. 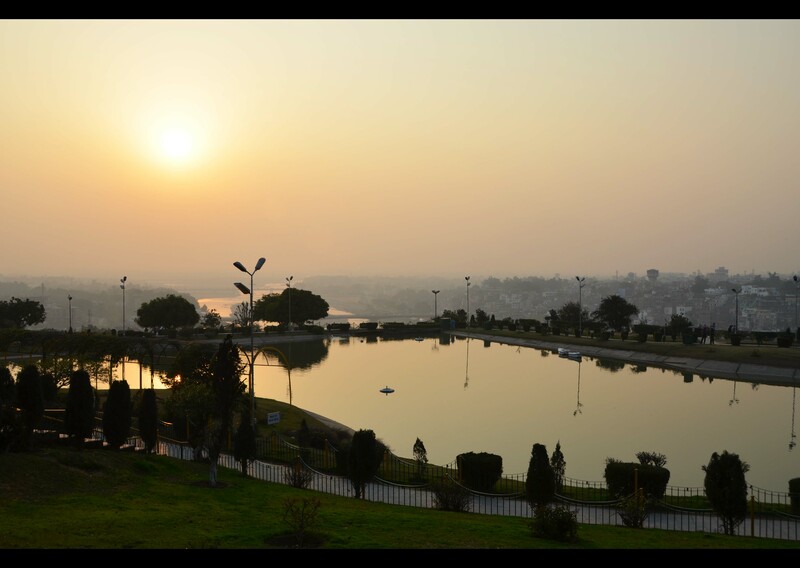 Click to read what happened before I reached Jammu..
Click to know how and where it all started..